Funky Seventies is a 40 payline and 5 reel video slot machine with a max jackpot of 20,000 coins which can be won with just one spin of the reels. 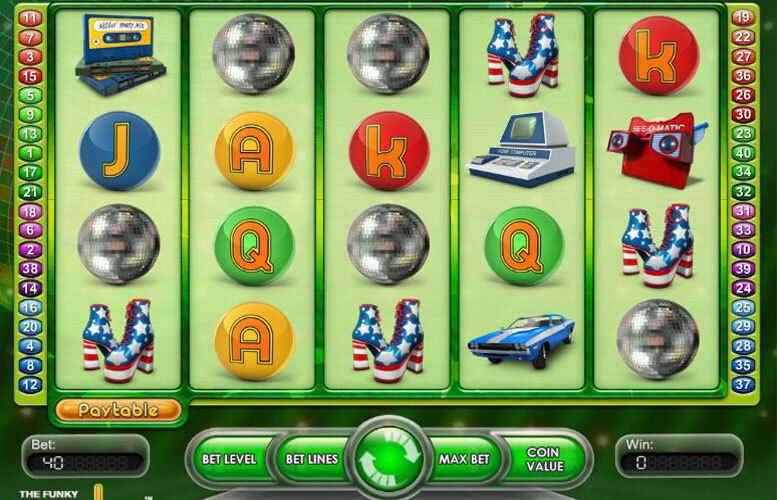 It’s also got a free spins symbol which can be re-triggered time and time again leading to monster payouts! The symbols on the Funky Seventies game give off, as expected, a 70s vibe, but the background and color scheme doesn’t seem to fit the theme quite as well (this might be a matter of personal opinion but in ours it could be better). The pay line options for the Funky 70’s slot game are some of the highest we’ve seen at forty paylines in total. Not bad considering, like most modern slot machines, it’s played across 5 different reels. The top jackpot for this game is 20,000 coins which can only be won by triggering and re-triggering the free spin rounds. The highest paying combination is the 70’s Wild which pays 1,000 coins when you match up five on any of the active paylines. This max jackpot isn’t bad for a game that features penny bets and low stakes gambling. The high level of pay lines make it easy to earn fairly high and regular payouts with every spin, which makes it a lot easier to get closer to the jackpot every time you play. There are stacked wilds in place so you can earn higher bonuses which will boost your totals when you start getting into the more competitive aspects of the game. 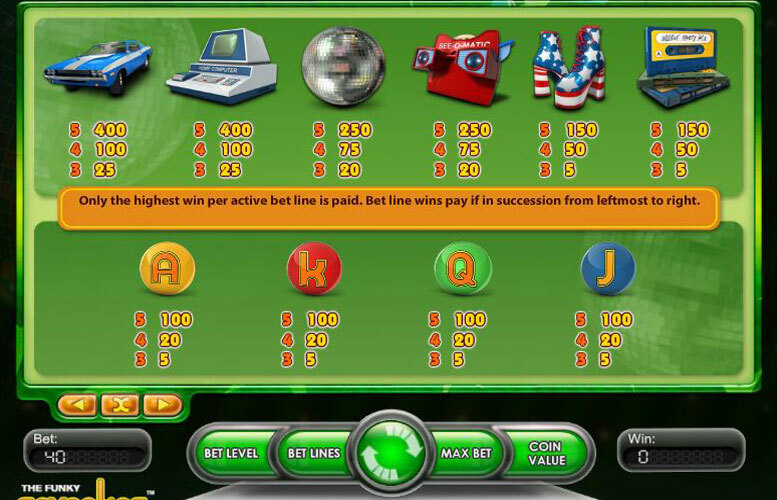 You can bet 0.01 through 0.50 for each coin, and up to 5 coins per pay line by increasing the bet levels. There are forty pay lines that you can play with every bet. A cap of £100 (200 coins at 0.50) per spin is in force for this game. You do not need to work at the maximum betting level in order to be eligible for the maximum jackpot. Due to the extremely high number of pay lines, it is highly recommended that you enable as many as possible (lower your coin amount if you need to) if you hope to get a better chance at winning the maximum prize. There are fewer of each symbol on each reels to help combat the number of lines possible to balance out the betting. Funky 70s Girl – This is one of the wild symbols for the game. She can appear anywhere on the five reels to assist in making wining combinations. The other bonus does not substitute for this one, though the two can be stacked. Three or more of this symbol enable the free spin bonus round where the player can earn free spins while making matches that pad their overall winnings. 70s Wild – The other wild card can line up on each reel to create stacked wilds. You cannot substitute this for the other wild symbols on the board. You can, however, use it to activate the free spins bonus round. Either wild can earn the maximum jackpot when matches of five are made as well as 200 coins for matches of four and 5o for matches of three. 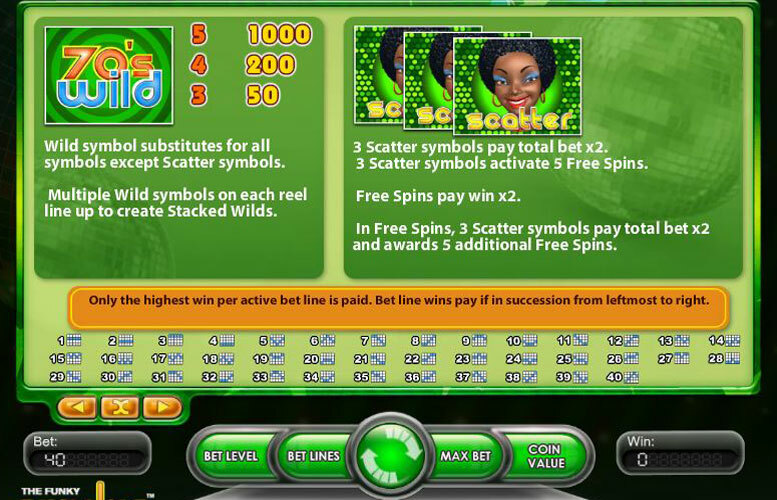 Scatter – The scatter will only go into effect when matches of three are made, offering a multiplier of 2 to any winnings that are gained due to the pieces being shuffled. You cannot replace this symbol with either of the wild cards. 1970s Charger – 25 coins for a match of three, 100 coins for a match of four and 400 coins for a match of five. 70s Computer – payouts are identical to those of the 1970s charger. Disco Ball and See-O-Matic – During regular play, players can match three of either of these to earn 20 coins, four to earn 75 and five to earn 250. Platform Shoes and Cassette Tapes – Both of these appear on all of the reels during regular play and offer winnings of 5 coins for matches of three, 50 coins for matches of four and 150 coins for matches of five. Cards – Cards in this game are offered in Jack through ace. These will appear equally across all three reels and can be matched to earn winnings throughout regular play. Matches of three earn 5 coins, four earn 20 and five earn 100 coins. This game has a rating of 3 / 5 with 157 total reviews by the users.